I saw the Obol in Brookstone over a month ago and really liked the idea of having the cereal and milk separate in order for the cereal to stay crispy the entire time you are eating. Recently, I saw a post about it a food blog and started thinking about the idea of Obol again. 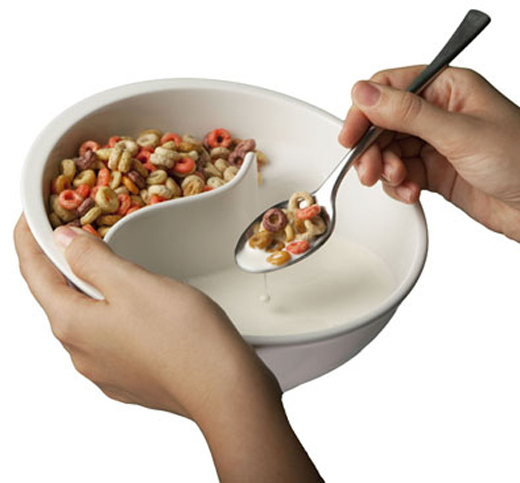 Imagine yourself eating out of a regular bowl of cereal with milk. The best bites are the first few because the cereal is the most crispy at that point. But, there is at least two more reasons why the first few bites are typically the best of the bunch. Point number three below I believe affects people on a more psychological level. It is easiest to get a huge scoop of cereal on the spoon! After determining that these are the reasons why I truly like cereal (besides the overall great taste), it is easy to determine that the Obol is does not significantly help me eat and enjoy my daily cereal. Obol performs task one very well. Task two is iffy. It may take longer for me to eat the bowlful of cereal, thus the milk will be warmer by the end (I am a cereal milk drinker). Obol fails at number three. By only putting a little bit of cereal in the milk compartment, the cereal spreads throughout the entire surface area of the milk, causing me trouble when I try to get a large scoop of cereal on my spoon. If I put any more than a little bit of cereal in the milk compartment, then I might as well be using a regular cereal bowl instead. An idea for a bowl is to throw it in the refrigerator or freezer overnight and in the morning you can enjoy colder milk for a longer period of time! I haven't actually tried this out yet, but I will! Number two improved. Another idea for a bowl to add a little vertical strainer on the coming out from the side. Milk will be able to go through the strainer, but the cereal will not. This could be a clip-on that would fit most bowls. Maybe it just have a little lip on it that allow it to sit on an edge. The idea is that you can gather up all the cereal to one side of the strainer, then a big scoop of cereal will be easy again. You could potentially just swirl your milk with the spoon and like magic, the cereal will all be gathered in one place. Number three vastly improved! !